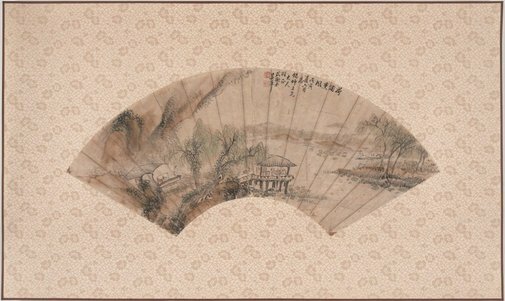 Paintings on fans are very unique genre in traditional Chinese art. It is believed that as early as the 3rd century artists decorated fans for the elite. There are two types of painted fans in China. The first is Tuanshan, meaning piece of silk in a round or ovoid shape inside a frame attached to a bamboo or wooden handle. Whilst this type appeared earlier it became very popular in the Tang-Song dynasties (7-13 century). The second type is called Zheshan, a folding fan, probably introduced to China from Japan in 10th century. By the 14th century it had become a favourite media for many famous painters and calligraphers who took on the challenge of producing exquisite paintings and calligraphy within the restricted space of the fan. These days they have become a popular item of appreciation by literati and collectors of Chinese paintings and calligraphy. There are several artists called Wu Ping. Judged from its style, this painter Wu Ping, was probably a native of Yangzhou, probably was a member from the “Shanghai school”, who left China and settled in Taiwan in 1940s. The title of this fan painting comes from the four characters written on four screens which were placed inside a small pavilion. This pavilion was built inside the Jiang Yuan garden for a Qing dynasty’s business man and official, Jiang Chun, during the Qianlong era (1736-1795) in Yangzhou, Jiangsu Province. The scene has been reconstructed at the present-day Shouxi Lake in the city and is famous for its lotus flowers.